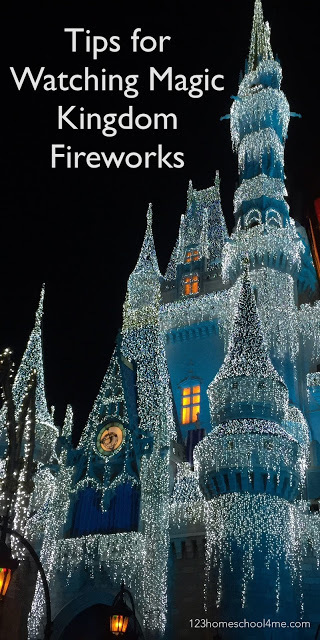 If you are planning a trip to Disney World you are going to want to read these amazing tip for watching Disney Fireworks. of the past and your best bet is to visit when it’s busy but not packed to the gills. Obviously, these enormous crowds mean super long lines most days and jam-packed performances on a regular basis. This includes the fireworks displays, which are perhaps the most crowded events of all. long waits, the idea of waiting in shoulder-to- shoulder crowds to see the show is a truly terrible one. you. How do you go about this? Try the simple tips below! overpriced popcorn), glow sticks or toys, a blanket to sit on, and small items to entertain the kids, such as card games. snacking and playing games. Be sure to bring extra glow sticks to share with your neighbors, and you may even make a friend or two. an hour beforehand is ideal. 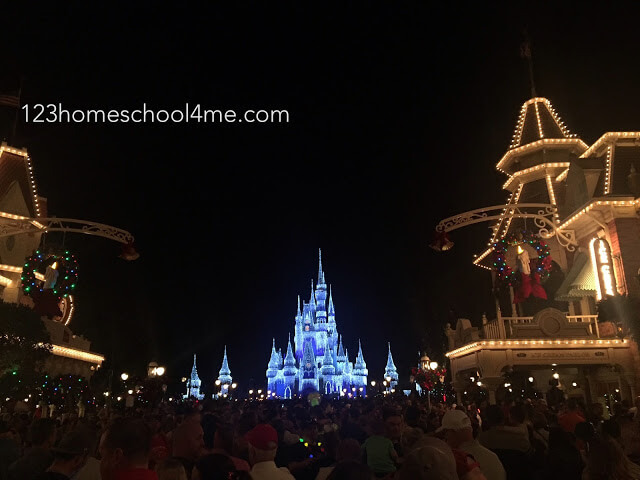 This will ensure you and your kiddos can see the entire show, including the projections on the castle, which are amazing. On the grass — There are two open grassy areas on either side of the hub that were once set aside for FastPass holders. Now these areas are open to the public and are great places to watch the show. Try to get a spot close to the fence nearest the castle to avoid having people block your view. On the bump — There is a place just a tiny bit north of Casey’s Corner and Main Street Ice Cream Parlor where the road is highest. If you can score a spot here, you will have the advantage of being a bit taller than everyone around you, meaning you will have an excellent view. That said, you can sit in the middle of Main Street, so you will have to hang out on the curb until 20 minutes or so before the show and make sure you jump into the road before this spot fills up. At the station — Head back to the exit and up the stairs to the train station for a pretty alright—if a bit distant—view. Get to this location early, and make sure you grab a spot right by the railing so you can see without heads in the way. Also, be warned that the flagpole will be in your view, though it doesn’t block much. In Fantasyland — So, if you don’t want to camp out forever, and the projections aren’t super important to you, you can always seek out a spot in Fantasyland. 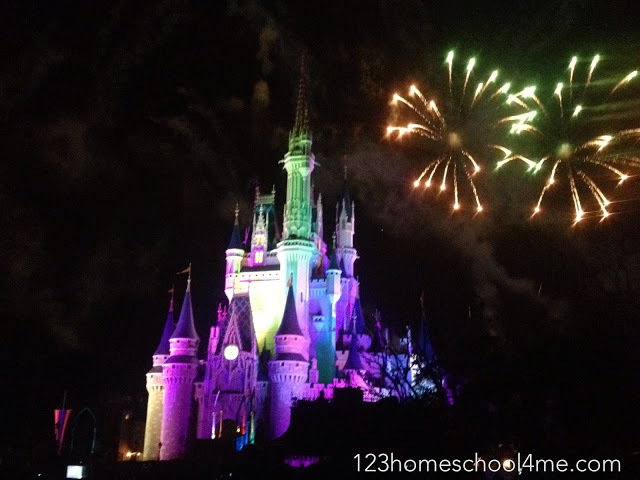 My family will occasionally watch the show from near Gaston’s Tavern, and it’s an interesting spot because you can see fireworks near Beast’s castle as well as Cinderella’s castle, making it an immersive experience. buckling kids into their strollers might be necessary, and holding the hands of older children is a must. it’s worth a few extra minutes of sitting to avoid being herded like cattle and bumped and jostled through the park. Besides, there is currently a projection show immediately following the fireworks, meaning you’ll have plenty to do. If crowds make you really nervous or grumpy, or even if you just don’t have a ticket to a park during one day of your trip, you might consider watching the fireworks from outside the park. everyone, including mom and dad.